Karen Kerrigan is president and CEO of Small Business & Entrepreneurship Council (SBE Council) and is a tireless advocate for small business owners. She recently participated in the White House briefing on the Trans-Pacific Partnership (TPP) held in D.C. Nov. 18. I’ve known and admired Karen for years and am amazed at how she finds the time and energy to do all the things she does so magnificently (refer to her bio). I was honored when she took the time out of her busy schedule to speak with me about TPP, how it will benefit small business owners and when the agreement will go into effect. Here’s an excerpt of our interview – part one of a two-part discussion. Laurel Delaney: What will TPP do for small business owners? Karen Kerrigan: TPP open ups new market opportunities for American small business owners and entrepreneurs in the 11 foreign countries that are party to the agreement. These countries - Australia, Brunei Darussalam, Canada, Chile, Japan, Malaysia, Mexico, New Zealand, Peru, Singapore and Vietnam - account for 40 percent of global GDP and are a mix of developed and emerging nations. It is the largest and most comprehensive trade agreement ever negotiated. Trade agreements by their nature remove barriers to markets, and the TPP certainly accomplishes that and more. For example, the TPP is the first trade agreement that explicitly requires participating nations to provide technical assistance and web portals to small business owners to help them navigate TPP markets. 1. The reduction and elimination of 18,000 tariffs currently placed on U.S. exports. This includes tariff elimination on all manufactured goods. For example, car engines and parts currently face up to a 70 percent tariff, and construction machinery as high as 60 percent. U.S.-made beer tariffs will fall to zero from levies as high as 47 percent in some TPP countries. These tariffs – or taxes – are a major barrier to market access. In addition, the U.S. does not impose various tariffs on goods that import here, so the TPP enables a competitive playing field for American small businesses. Since TPP countries as a group “are the largest goods and services export market of the United States,” according to the office of United States Trade Representative (USTR), tariff reduction and elimination will be a significant tax cut for U.S. businesses. 2. Reduces regulatory complexity. Regulatory cohesion among TPP nations will help to ease the risks and costs of doing business abroad for small businesses. Easing customs administration and improving trade facilitation will help small businesses get their goods and services to market – or their customers – more quickly, which means reduced costs, quicker payment, better cash flow and greater certainty in doing business in TPP markets. 3. Intellectual property (IP) protection. TPP countries will be required to bolster or implement IP regimes that make it easier for small businesses to register their trademarks, patents, copyrights, trade secrets and other forms of IP. More importantly, strong enforcement systems in TPP countries are required. For small businesses, IP theft and costs involved in protecting IP is a major risk and barrier for going global. Strengthening IP and lifting standards is a helpful component for all types of small businesses that are held back due to the fear of theft or infringement. 4. Electronic Commerce Improvements. The agreement addresses critical e-commerce concerns and barriers, which will vastly improve the opportunity for small businesses to do business in these countries. The TPP promotes open Internet policies, and countries cannot block the websites of companies that may compete with their own country’s businesses. TPP countries cannot require companies to build data centers as a condition for doing business in these countries, and the agreement forbids customs duties on e-transmissions – for example, on software services and other digital products. These provisions reduce the cost of doing business, improve access to markets and allow small businesses that utilize platforms to sell goods and services – for example, on Etsy – competitive access to TPP markets. TPP nations are each required to develop websites dedicated to helping small businesses understand the agreement as it relates to accessing their markets. According to the USTR these web portals will “provide easily accessible information on the TPP and ways small firms can take advantage of it, including description of the provisions of TPP relevant to small- and medium-sized enterprises; regulations and procedures concerning intellectual property rights; foreign investment regulations; business registration procedures; employment regulations; and taxation information.” Ready access to information and technical assistance saves time and costs for entrepreneurs. These tools are required to be “user-friendly” and could be an effective service to small businesses that are new to global trade, or those who have questions about doing business in specific TPP markets. LD: When will TPP go into effect? KK: It all depends upon when implementing legislation is introduced in the House and Senate, and when other countries approve the deal through their legislative channels. Once the U.S. Congress introduces an implementing bill for the TPP (there is no deadline for this step), a timeline with deadlines is triggered. This is what we know thus far: President Obama informed Congress on Nov. 5 that he intends to sign the TPP. This triggered a 90-day review period of the text of the agreement, which means the President will sign the TPP in February 2016. If and when the House and Senate file legislation upon the President’s signature, the deadline for votes begin 45 days after the bill is introduced. The House Ways and Means Committee will vote on or before the 45th day, and the full House has 15 days to vote on the bill. The legislation then moves to the Senate where the Finance Committee has 15 days to vote on the bill, followed by another 15 day period for a full Senate vote. Karen Kerrigan is president and CEO of Small Business & Entrepreneurship Council (SBE Council). This is the final part of a two-part interview where she talks about a small business success story and other ways TPP will boost business for exporters. If you are new to TPP, you might familiarize yourself with the agreement here. Laurel Delaney: Can you give a specific example of a small business owner who is waiting eagerly for the passage of TPP because it will have a dramatic affect on his/her company’s international performance? Karen Kerrigan: As noted in a recent piece, small parts manufacturers like Cobalt Enterprises (which started in a garage) in Washington state is eagerly awaiting the TPP agreement. It will lower barriers and bring more work. Companies that already work in the global marketplace as part of a supply chain, such as Cobalt, realize the enormous potential for the growth of their businesses. Small businesses in the food and agricultural sector also see significant potential for gain, not only because the current tariffs they face are real costs to their businesses (and they will get an immediate tax cut), but growth in beef, poultry and pork exports. The agriculture industry is dominated by small businesses. Specialty food producers – again mostly small entrepreneurial companies – see huge gains, particularly as traditional market access measures are complemented by e-commerce provisions, which allow websites to appear live in TPP countries. Obviously the latter is true for all small companies that have an e-commerce presence. LD: Will TPP only affect product exports or will service exports also get a boost? KK: Yes, trade will also be liberalized in this area. No TPP country can impose quantitative restrictions, require specific legal entities or joint ventures or a local presence (setting up offices in TPP countries.) In the financial services area, for example, providers do not have to establish in-country operations. Foreign financial companies can also provide new and innovative services if domestic companies are allowed to do so. LD: How will intellectual property be protected under TPP? KK: In some TPP countries, it is currently very difficult and costly to register IP and effectively protect it. In addition, the commitment to protecting IP is not as strong or taken as seriously as others. Obviously, many small businesses fear doing business abroad due to IP theft and the vast costs involved in protecting IP. All TPP countries are required to make the registration process easier for patents, trademarks, copyrights and trade secrets, including safeguards against cyber theft. TPP countries have made a strong commitment to enforcement. This includes civil procedures and stronger penalties – including criminal ones – for infractions. LD: Countries that are a part of TPP intend to provide technology know-how to small business owners to enable them to do business in their market easily. How will this pan out? KK: I believe some countries will do this better than others at first. Once countries establish their web portals and country-specific tools, best practices will emerge that will help to hold TPP nations accountable to their small business commitment. The other important piece is the requirement for regular review of how the TPP is working for small businesses. There will be a distinct council or committee established as part of the TPP framework whose function will be to receive feedback and ideas from the small business community to improve how the agreement can work better, and strengthen each country’s commitment to helping entrepreneurs access their markets. 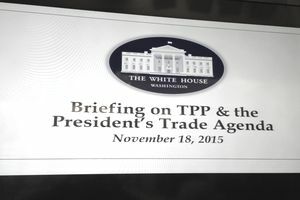 LD: Beyond business owners, what industries (e.g., logistics, banks, transportation providers) will stand to benefit the most from the passage of TPP? KK: A whole hosts of businesses in countless sectors stand to gain from the TPP. For sectors that have been effectively locked out of these markets due to high tariffs, which again are numerous (18,000 in all), the agreement opens the door to competitive access and growth. For example, U.S. food and agriculture imports totaled $58 billion in TPP countries. Again, tariff elimination and reduction will be a huge boost to small food producers and farmers who currently export or wish to export. Japan, for example, places tariffs as high as 11.9 percent on fresh and frozen cuts of poultry, and these will eventually be eliminated. From food to fashion, textiles to telecommunications, banking to beer, manufacturing to software – countless industries will benefit. LD: Where can small business owners get more information on TPP? Entrepreneurs and small business owners can also bookmark the Small Business & Entrepreneurship Council website or sign up for our e-newsletter as we will be providing regular updates on the progress of TPP, and new developments and information on opportunities for small businesses. Dog Food Recall: Are Pet Foods Made in Thailand Safe? How Do Global Strategic Alliances Work?